Ingrid was born and raised in Dallas, Texas. She left as a young adult to pursue life in Europe, New York and later Aspen. But Texas never forgot her.. or her talent. In October of last year, well known Houston art lover and philanthropist, Carolyn Farb, commissioned Ingrid to do an altar for her home. 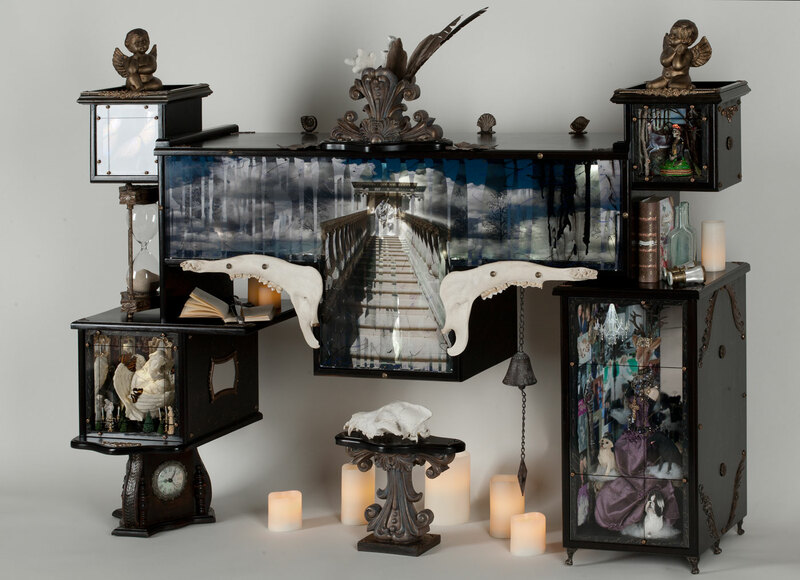 Creating a commissioned work of art is certainly a challenge, but an altar is so personal and spiritual, it brought the experience to lofty heights. Ingrid worked on the piece for over six months and the results are nothing less than stunning. The journey not only produced a spectacular work of art, but also a deep artistic connection between the two women. The altar was installed in mid-April and Carolyn and Ingrid met each other for first time in person, but also as long time kindred spirits. On April 15th, Carolyn Farb generously opened her home to honor the new installation. Friends and art lovers from Aspen, Houston and New York City came to the event to share her enthusiasm. Enjoy the photos from the event. Warmest thanks to Carolyn Farb for her love of art, generous spirit, and hospitality! This entry was posted in Carolyn Farb, Commission, Houston and tagged Altar, Carolyn Farb, Dallas, Houston, Texas Art, Unix Gallery. Bookmark the permalink.